It's The Beginning of the End this Friday! For some reason, a whole lot of people are flipping out about the end of the world. You know it's fast approaching, right? Of course, this trollop wouldn't leave you astray. In fact, I want you to be prepared for end and we're here to help. The Mayan Calendar. The Zombie Apocalypse. The Galactic Alignment. The Zit on Prom Night. All signs that life on Earth is coming to an end! 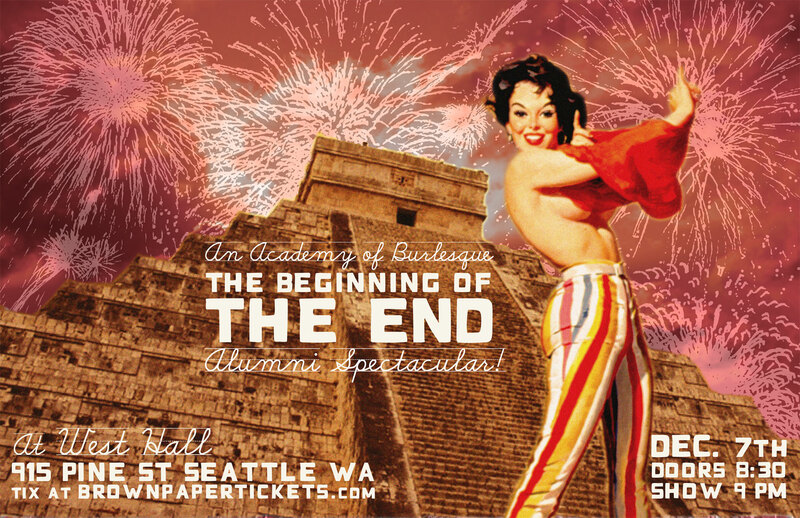 The planet will shake, the heavens will open up & your knees will tremble as The Academy Of Burlesque brings you "THE END OF THE WORLD AS WE KNOW IT!" Featuring our special guest: "Your Own Private Radical," RANDI RASCAL! Survive the night with your host: LOWA DEBOOM BOOM! Tickets are $12 with the Friend/Family discount code, $15 in advance, and $17 at the door!